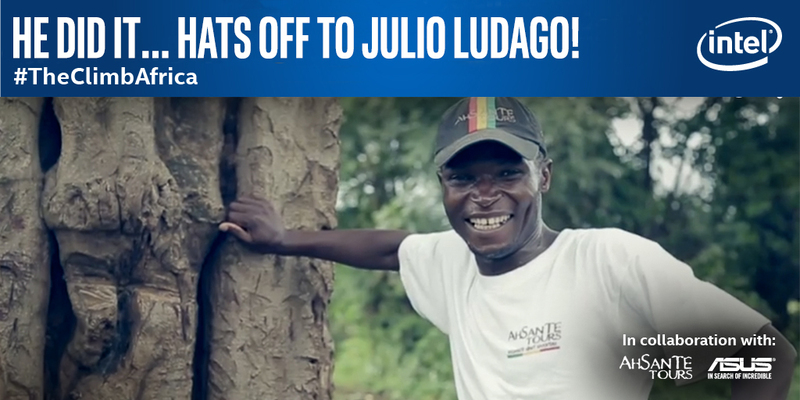 Two winners have emerged from Nigeria in the Intel #ClimbAfrica competition meant to predict the time it will take Tanzanian Julio Ludago to ascend and descend Mt. 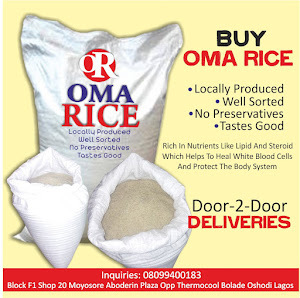 Kilimanjaro, NaijaAgroNet reports. The winners, Allan Thairo, and Dennis Murii Irungu had the most accurate predictions on how long it would take Julio to climb Kilimanjaro, with 11hours, and 10 hours, 45 minutes and 30 seconds respectively; and will receive the Asus Transformer Book T100 and Asus Fonepad. Sponsored by Intel Corporation, ASUS and his employer Ahsante Tours; Julio, who set out on Sunday, September 27, 2015 to beat the world record of ascending and descending Mt. Kilimanjaro currently held by Swiss-Ecuadorian Karl Egloff at 6 hours, 56 minutes and 24 seconds put up a spirited fight to complete the climb and finished in 11hours, 8 minutes, thus becoming the second Tanzanian and African to make this attempt to climb and descend the highest Mountain in Africa in the shortest time on record, NaijaAgroNet reports. Finishing his climb, Julio said “I knew it was never going to be an easy task for me, but I had a lot of determination. I also drew a lot of inspiration from the support I received from the people who cheered me throughout this challenge. 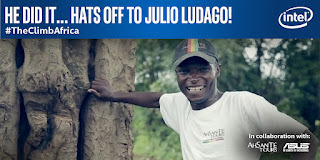 NaijaAgroNet recalled that Intel, through the use of technology enabled Julio to track his fitness levels and also share his extraordinary experience with Africa and beyond. Throughout the preparation stage and actual climb, he used Basis Peak to help him track his activity, health and sleeping metrics 24/7. He was able to continuously monitor his heart rate, movement, perspiration and skin temperature throughout the climb. Julio also had an ASUS Transformer Book T300 Chi powered by Intel. The razor-thin and powerful 2 in 1 device with a 12.5” screen was useful during his preparation phase to track weather conditions, create a schedule and measure his progress. He was also able to surf the internet to get exercising tips and keep in touch with his fans.